Mobile network operators are investing in infrastructure that enables the delivery of Internet of Things (IoT) service offerings. They're also establishing relationships with leading technology vendor partners -- to create a viable ecosystem that will attract software application developers. Cellular machine-to-machine (M2M) connections will reach 733 million globally by 2021, according to the latest worldwide study by Ovum. Moreover, they also have forecast that total cellular M2M service revenues will reach a global annual total of $67 billion in 2021. The greatest revenue contributions will come from three key regions across the globe -- Asia-Pacific ($22 billion), North America ($16 billion) and Western Europe ($14 billion). Many wireless service providers will maximize their revenue opportunity by extending beyond connectivity, therefore Ovum also includes the proportion of revenue from the M2M service layers. Their forecast has identified the segmentation by the existing mobile network technology family. Of all the current wireless generations, 4G LTE will likely become dominant, accounting for 212 million connections in 2021. Ovum notes that LTE is an adaptive technology for machine communications, because unlike 2G and 3G it's tunable to the specific needs of the service provider. In 2021, 2G and 4G will be at a point of parity, while 3G will account for 172 million connections. Yet, by this time, 2G and 3G will be plateauing, while LTE will be firmly in ascendance. "Aggregating the data by technology family reveals interesting trends in M2M, the dynamics of which are quite different to those in consumer markets" said Jamie Moss, principal analyst at Ovum. M2M contracts typically reach the end-of-life stage before any network migration occurs. 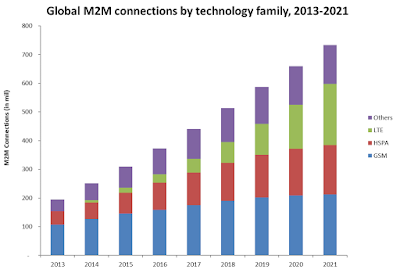 Consequently, 2G, specifically GSM, will persist for far longer in the M2M marketplace. According to the Ovum assessment, large carrier groups with established M2M businesses will not seek to switch off their 2G networks until 2020 -- and for some carriers this will not occur until 2025. But this decision is not merely for the sake of legacy support: 2G M2M connections will continue to be added, because 2G still represents the most affordable and internationally available form of wireless network coverage. Although both 2G and LTE are forecast to have approximately 212 million M2M connections by 2021, 2G like 3G will be plateauing with LTE firmly in ascendance. As a result, Ovum says the increasingly competitive nature of the M2M market now demands forecasts with greater segmentation and more accuracy.